i never quite feel like i’m breathing (i tell her) – it’s like i’m walking around trying to inhale deeply a sweet breath that finally fills my body and being, but the world and i and my breathing are just shallow little gasps. she places her hands upon my throat and keeps still. they always want you figured out: masculine or feminine, pleasing or displeasing, sharp or dull, attractive or unattractive. but i don’t think i’m rightly made into or described as any of those things. i think our bones understand energies we ignore and this is where anguish comes from. most of us are buried with it. her hands are moving now as if to pull the evening down over us like a shade. the golden eyes of stars protruding. she and i and our sick thoughts dark and rich and ringing hollow as a moonless midnight. i extend a finger and begin to trace the imprint of the words now carved eternal into rough stone: “the past and present are as one— accordant and discordant/ youth and age/ and death and birth/ for out of one came all— from all comes one.” from all comes one, we are stories birthed in half. quieted by the silent smoke of purple November, she listens with the softness of an afterlife i’m thirsty for all over. the air between us is the beg of touch without relief. we are stories birthed in half. we are the tears at the start of the bleeding. it’s the blank mind that frightens; one made so terribly messy that all the lines crisscross over top of each other endlessly rendering each individual thought useless. it’s a blank made of noise, crushing static noise. the sound; the vision of suffocation. but they tell me to write whatever comes and not hold back just keep on so i do until the looks, the ones i can feel without even seeing them, the looks bore into the back of my head like insects boring into the side of a tree they know only how to eat from the inside until they die in there along with the beast. trees are beasts of course, they too have heavy eyes and knowledge, skin and teeth and bones and wisdom; tears. feelings. longing. i once read that if a tree is dying, a tree close to it will wrap its roots around the dying one’s roots in an attempt to share nourishment. like holding hands or… donating organs, i guess. i think that is beautiful. and so very sad. i wonder how many humans would do that. i wonder if i would but oftentimes i am truly very numb. i’ve let up on the drinking a bit but i still go numb from feelings. some my own, some borrowed. i think we want to read someone else’s diary in the hopes of finding the nastiest parts of ourselves. we are all spies but it’s just to try to end the loneliness. i think we want to grow wings and save ourselves but that’s as far as we think. what if we did get out of this terrible nightmare city of death, lies, cruelty, and destruction. what if this were no longer reality but some kind of emotion-soaked memory of a time we fucked everything up but figured out a way to undo the whole damn thing. the human heart beats for a time before it stops and vanishes forever. the human, her feelings, her gut, her mind, does the same thing. we are (i am) smoke and mirrors, we are embers falling from those mighty trees, eaten from the inside. and i keep writing because they tell us not to stop. who tells us? the ones looking for something to read, i guess. the childlike ones whispering in the dark to the monsters in their hearts: i love you, i love you, i love you, i do. the rain begins again, the gray of the sweeping sky sliding cold along my windowpane and it is the season it is. i blink away dry invisible tears. wipe away the coffee rings on the pages of all the things i don’t know how to say. they do not budge. the leaves are flaming and the air is not quite a sharp razor, not quite a soft kiss. as i look along my wrists i see butterflies circling the veins. i see angels in the clouds and i stare out across the brownish fields looking for something like an animal. like a little girl is able to run away to escape herself. I come before you this first Monday of October to say simply that I adore you and I am taking a break for a while from schedules of many kinds, including the Monday schedule for these love letters. I don’t mean to sound dramatic, as I’ll be back of course, it’s just that I take commitments and dates and plans to heart; I try my best to honor them. They are important to me, especially in this day and age where people ghost you without even a second’s thought. That’s not the kind of person I am. The truth is I am going through some major and very personal transformations right now and while I am eager to share them with you some day in the future, I don’t quite have a handle on them just yet. When we think of growth, we tend to think of something emerging — the tiny beak of a little baby bird peeking through the eggshell, the soft green stem of a rose bush busting up through the earth. But we forget about the part of growth that is happening deep below the surface. We cannot see the warm, silent, dark, wet world inside that egg, or the cool rich pressing soil cradling the seed deep inside the ground. But it is there, and it has a very specific and important job to do: it is the quiet, pulsing environment in which to cradle new life, to nourish new life, to bestow strength on new life. There is a sacred part of change, of growth, of transformation, that happens in the dark. Out of sight. In the shadows. This is where I am right now. I don’t know what is to come. But I know I will never know the full breadth and depth and miracle of it unless I surrender fully to it. There is something about me and my work I need to learn in private before I can share it in public. During this time, I thank you as always for your kindness and understanding. I will see you soon. P.S. Here is something I wrote recently about this change I’m going through. Perhaps a glimmer of what may be to come. Whatever comes next, I can promise you this: it will come from an even deeper love than I can yet imagine possible. I am afraid, but I trust love with all my heart. Though it is just barely autumn here in the U.S., I have already found myself cozied up to more than a few bonfires on these recent cooler evenings. Bonfires in the chill of a crisp fall night, surrounded by the crickets below and canopied by the dark trees and bright stars above, are some of my absolute favorite things. The promise of change — bold, rich, deep, earthy, soulful transformation — crackles in the spiced smoke air. Every cell in my body can feel it. After all, if you let go of everything you have created up until this point, doesn’t that mean it was all for nothing? No. In fact, it is the opposite. To let what is done be done is to dare to honor the full cycle of creativity: life, death, re-birth. No one better described this feeling than a woman whose brave, difficult, critical and important work I have been following for only a few months but who has dramatically changed my perspective on the world around and inside me. Layla F. Saad is a Black feminist writer, racial justice advocate and spiritual thought leader. I could write for hours about Ms. Saad’s impact on me, and on the culture at large, but that is best left for another time and space. What I most want to share with you on this Full Harvest Moon Monday is an excerpt from Layla’s recent essay, which she shared privately with her most loyal followers. She sums up exactly how I am feeling now, about setting myself on fire so I can start over. That letting go in order to move on is what is required of all of us at various points throughout our lives, and that does not mean our past was not vitally important. It’s just that what is done is done, and it is time to move on toward the next beautiful thing. Sometimes what is next is deeper and therefore more painful. Often it is the most painful things which can teach us the most but only when we are ready to face them. I can feel that time is bubbling up inside of me. I sense the claws, cries, whispers, and possibilities of my own personal stories welling up inside. Stories I have never shared before. Because I was not ready. It was not time. But if it is now their time to come forward, I must honor that. That is the call of all writers always, to let what needs to come forward come forward, no matter what the reactions may be. There is a secret wisdom in this work of writing which can only be revealed through the practice of doing the writing itself. By paying attention, by listening, by remaining alert and willing. After a while you learn to sense the turning of seasons. You can see it in the way the wind catches itself in the withering trees. If I am to move forward in this way I must first take the time to go silent and search inward for the messages coming forward. To tune out the world and tune into myself. To burn myself to the ground in order to emerge a new season. She’ll help you find treasure. but she’ll guide you right into the minefields first. Are you feeling it is time to make a change of your own? Are there things you are doing that feel like they are dragging you under, that perhaps they would be better off let go of? If you are going through this time of transformation as well, I understand. And I wish you well on your brave journey inward. Burn, baby, burn. i think women want themselves. we want to be fully ourselves. to get to know ourselves before the shame, before the charade, before the cruelty, the confusion about whether or not we are allowed to be here. i gave everything i had to men. my worth, my dignity, my body, my tears, my beauty, my health, my heart, my joy, my loathing, my terror, my most precious gifts, my sanity, my hurt, my insecurity, my creativity, my time, my desire, my mess, all my resurrection, all my death. just gave it all away constantly because women are taught to repent for sins they did not commit. to pay for a debt they can never repay. There comes a time when something helpful can become harmful for the same reason. Like having training wheels when you are learning to ride a bike, where at first those little wobbly wheels give you the courage and reassurance to get on and give bike riding a go, after a while they are not helping you but rather holding you back. If you want to ride with the big kids? The training wheels gotta go. I also found this to be true for me when it came to writing in my own unique voice. When we first start out writing we are imitations of all the beautiful writers we ever found interesting. These are the writers whose prose made your mouth water and your insides electric with desire to write — to write just to write — in the hopes of one day becoming as graceful as your favorite writer is on the page. This is a gorgeous thing, and in many ways it is why I want to offer my writing to the world: I want to awaken that desire in other budding writers. But just like those rickety training wheels, if you ever want to write like a big kid, you need to let go of what is holding you back from finding you own personal power and potential. Ironically, those writers who helped you get started will one day be the ones drowning you out. A while back, I found this to be true on my own writing journey. And I did one of the hardest things I have ever done in terms of evolving into my own voice, my own style, and learning to trust myself. I unfollowed one of my very favorite writers on all social media. No Instagram, no Twitter, no blog, no books, no nothing. This writer was so beautiful and rich in her prose, so maddeningly talented that it pulled at my veins to read every single thing she created. And it dawned on me that to continue to follow her would have swallowed me up, would have robbed me of discovering myself. This writer made me want to write from a place so deep I didn’t even know I had it in me until I came across her incredible work. But what I had to realize was that she was teaching me to dig deeper into my OWN INNER DEPTHS… not hers. A subtle difference and yet a major one. Those artists and writers we so admire have come into our lives because they show us glimpses of our own wild spectacular potential. For a while, we will try them on by way of imitation, however subtle. But when it is time (and we know when it is time if we are true and honest with ourselves) we must let go and believe we have our own inspired path to follow. One where those writers who got us started will fade to whispers while we take center stage. If you have been at your writing, or whatever your artistic craft of choice, long enough you will inevitably face the following annoying (though, annoyingly important) question: so… what’s next? No matter the milestone you reach — no matter how many books you publish or TEDx talks you give or exhibits you display or awards you win or tickets you sell or followers you gather — after all is said and done and the confetti is swept away and the empty champagne bottles are tossed a strew, eventually the quiet of endless future space will descend in around you and beg this one simple, maddening question. Perhaps strangers will ask this of you, or fans or family, or you will simply find yourself asking yourself: so, what’s next? Fear not, beloved, for here’s what. I came across an unlikely and absolutely brilliant answer to this question and it turns out that to actually find the answer we need to change the question. How terribly existential of us. And in that nearly imperceptible shift in how you ask the question about where you are headed in your creative life, or your life in general, your next step begins to come into much sharper focus. Because as creatives, we are change-makers. By choosing what we want to create, we create the world in which we live. So… what’s next? Well, maybe start at the end and work backwards… how do you want the world to be different when you’re done? Happy Monday, my friend. Today is a holiday in the U.S. and I will soon be doing all the holiday things: sipping fresh coffee and reading lazily through the glum sweet gray clouded morning, boating and drinking wine in the afternoon, and curling up to a campfire in the evening. But before I get to such delicious holiday things, I wanted to take a minute to share the work of an artist I cannot get enough of lately, Rimel Neffati. Her works (see examples above and below) are incredible, haunting, sheer poetry. I have long been fascinated by poetry of the word as well as poetry of image, there is a connection between them somewhere — there is some inexplicable thread that makes one somehow mysteriously like the other, though they are distinctly different artistic mediums. I think that thread, slender as it may be, is silence. A beautiful image, to me, is robust with an other-worldly silence. It blooms into a silent place inside you, almost without breath or movement, and fully without struggle. It is an effortless silence which reaches out, hooks itself to you and draws you in. 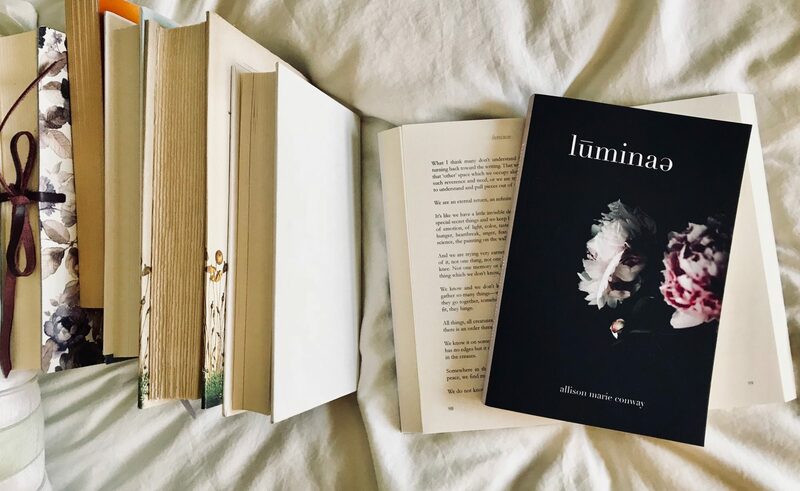 “Silence is the only true poetry,” I wrote in Luminae and I believe it so completely. We artists long to inhabit a silent thing, an elusive kind of love/pain/longed-for thing we cannot ultimately name. It is that silence, that empty space which begs us in constant to uncover the words it already contains, the images it already imagines. Perhaps this week we take extra time to give the silence a chance to speak. We meditate, we disconnect, we unplug, we stop trying to force our creativity and instead we sink into the silence that is always there, behind everything, and just breathe. I have often said that the best writing advice I can ever give anyone, especially my beloved kindred poets, is to write from the feeling, not about it. Do not be on the sidelines, do not be outside the house of your pain or joy looking in describing it, but rather be inside that house, inside that experience, deep inside. Go inside the silence, and write and create from inside that place. Readers know the difference. You know the difference. When the writer or the artist is fully immersed in the secret silent world of feeling, what comes forth is the essence of that magical space beyond words, beyond images. A truly gifted artist becomes that silence, and then brings it rushing, gliding, humming, pulsing to the surface. Poetry that speaks deeply to us, whether of word or image, all begins in silent space, in emptiness, in freedom. May we dare go silent and approach it with reverence.